According to John’s account, Mary of Magdala is the first to go to the tomb, when it was still dark, and sadly discover that it’s empty. Jesus is missing. The Master who had understood her and cured her. The Prophet she had followed faithfully until the end. Who would she follow now? So it is that she laments to the disciples: «They’ve taken my Lord from the grave and we don’t know where they have put him». These words from Mary could express the experience that many Christians are living today: What have we done with the Risen Jesus? Who has taken him? Where have we put him? The Lord in whom we believe: is it a Christ full of life or a Christ whose memory keeps fading little by little in our hearts? It’s wrong to seek «proofs» in order to believe more firmly. It’s not enough to turn to the magisterium of the Church. It’s useless to investigate the theologians’ expositions. In order to meet the Risen One we need above all to journey within. If we don’t meet him inside of ourselves, we won’t meet him anywhere. A little later, John describes Mary running from one place to another looking for information. But when she does see Jesus, she’s so blinded by grief and tears that she ends up not recognizing him. She thinks that he’s the gardener. Jesus just asks her a question: «Woman, why are you weeping? Who are you looking for?». Maybe we too need to ask ourselves something similar: Why is our faith all too often so sad? What is the real cause of our lack of joy? What are Christians of today looking for? What do we yearn for? Are we going around looking for a Jesus that we need in order to feel full of life in our communities? In this account, Jesus is talking to Mary, but she doesn’t know that it is Jesus. It’s at this point that Jesus calls her by her name, with the same tenderness that he had in his voice when they were walking through Galilee: «Mary!». She turns around quickly: «Rabbuni! Master!». 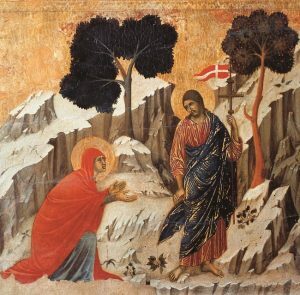 Mary meets the Risen One when she personally feels herself called by him. That’s it. Jesus shows himself full of life to us when we feel ourselves called by our own name and we hear the invitation that he makes to each one of us. That’s when our faith grows. We won’t revive our faith in the resurrected Christ by only nourishing ourselves from without. We won’t meet him if we don’t seek a living contact with his person. It will probably be the love of Jesus known through the Gospel and sought personally in the depths of our hearts, that can best lead to the meeting with the Risen One.